Leading up to the birth of Will, I was researching and asking a lot of people about labour and their experience. However, I quickly realized that anything can happen and everyoneâ€™s birth experience is different. I wish I had researched more about what happens in each stage of child birth. I reached a point in the last few weeks of my pregnancy where I couldnâ€™t absorb anymore information and just wanted to relax. There are some things that I missed! For example, I didnâ€™t realize that your waters donâ€™t have to break before contractions start, which is what happened to me. And that you can tear! I also didnâ€™t realize that feeding is every three hours! With my Mother being a midwife and neonatal nurse for premature babies, I felt reassured in a way that all would be okay in taking care of my little one. 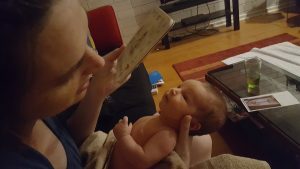 However, I still needed to learn myself and to read and respond to Willâ€™s cues accordingly, as every baby is different. Iâ€™m glad that I can breastfeed and Will has learnt to latch on well. I thank the midwives at Flinders hospital who were patient in teaching me how to breast feed and providing their tips and tricks. I often felt bombarded by the midwives about breastfeeding particularly at the 4am feeds, but it was worth it. You use all that information but eventually work out your own technique. I love seeing his content milk drunk face . A few days after Will was born he went back to hospital to treat jaundice with phototherapy. Given the stressful situation, his Dad and I had a good laugh seeing him in the goggles and giant dummy. He looked like he was ready to fly down the snow in a toboggan sled . I stayed overnight to feed him and sought out more information from the nurses about caring for him. They said that the reason the father settles him or someone else, is so that he can settle easily without smelling the motherâ€™s breastmilk! I didnâ€™t know this! Friends and family have offered advice for looking after a newborn and I have listened carefully as you can tell when someone has found something useful that worked well for them. At times it has been too much information, particularly with sleep deprivation! I have finally reached a comfortable point and feel he knows me and I know him. To help his brain and five senses develop, we have incorporated reading, singing, tummy time, staring at black and white images and hanging objects on play mat. We also play classical music from the radio to help him settle for sleep. He really enjoys being talked to and smiled at and this is also important for brain development. Your Zen Mama has been great for support with being a first time mum and looking after my little one, Will. Alice lives in Adelaide, South Australia and was born there in 1980. In the last three years, she has worked as a Child & Youth Support worker for children who have experienced trauma and are living out of home. She has since started studying a Masters in Social Work. She has a Bachelor degree in Commerce and Graduate Diploma in Primary School Teaching. She is keen to learn more about baby development and to help Will grow and develop.